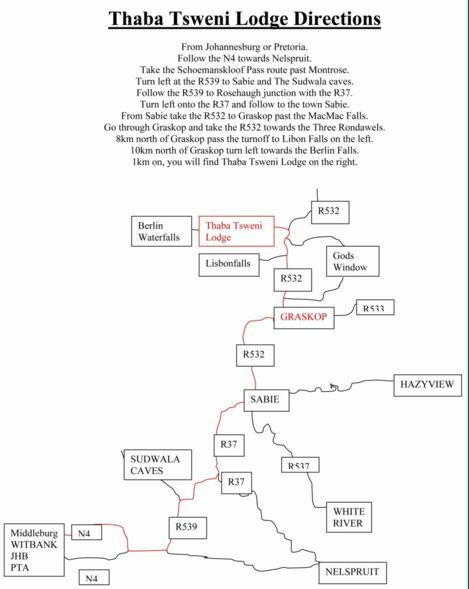 Thaba Tsweni Lodge is 9km north of the town Graskop and 38km north of the town Sabie on the R532 road, in the heart of the Blyde River canyon escarpment, of the Mpumalanga Province and the Drakensberg Mountains. As you travel north on the R532 from Graskop, you will pass the turnoff to the right, the R534 to Gods Window. Travel further along the R532, and 7km from Graskop you will reach the turnoff to the Lisbon Waterfall. Another 2km on and 9km from Graskop you reach the turnoff to the Berlyn Falls and Thaba Tsweni lodge on the left,turn left here. After a futher 1km you will reach the Lodge on the right hand side.